The completed chicken scooter along with the previously completed doggie, Scooter. Not too bad for a few hours work, huh? 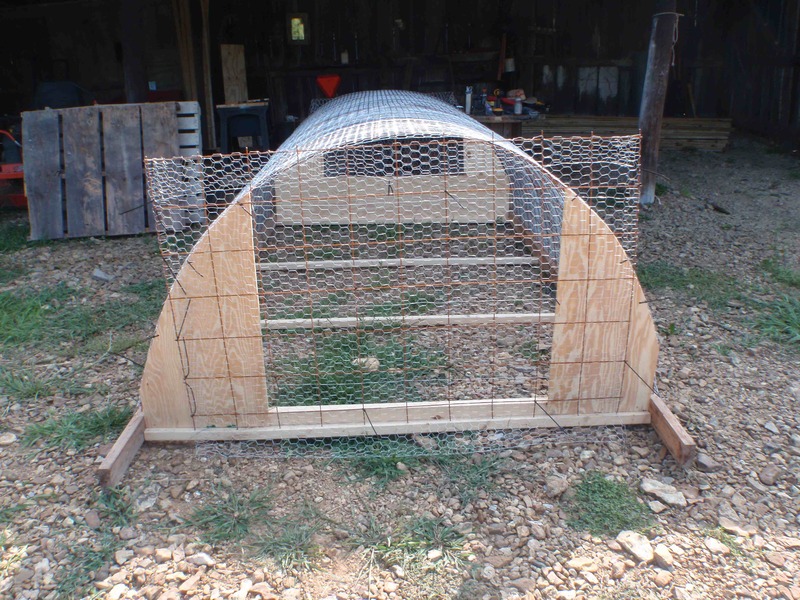 This chicken tractor – or “chicken scooter” as we’ll be calling it – will be the home for our first batch of broiler chickens to move across the pasture. 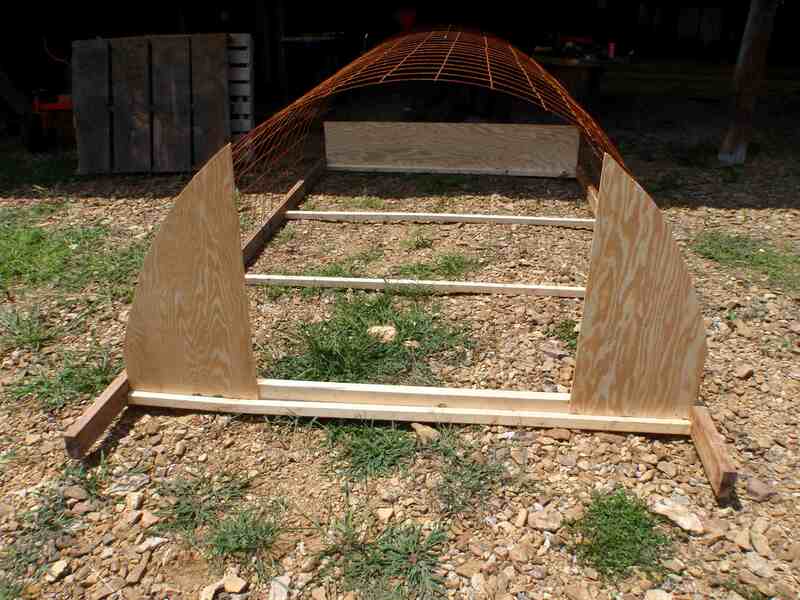 It’s 12’ x 6’, so that’s 72 square feet of green pasture for our group of 25 White Rock broilers. It stands a little over 3’ high in the middle of the arch. 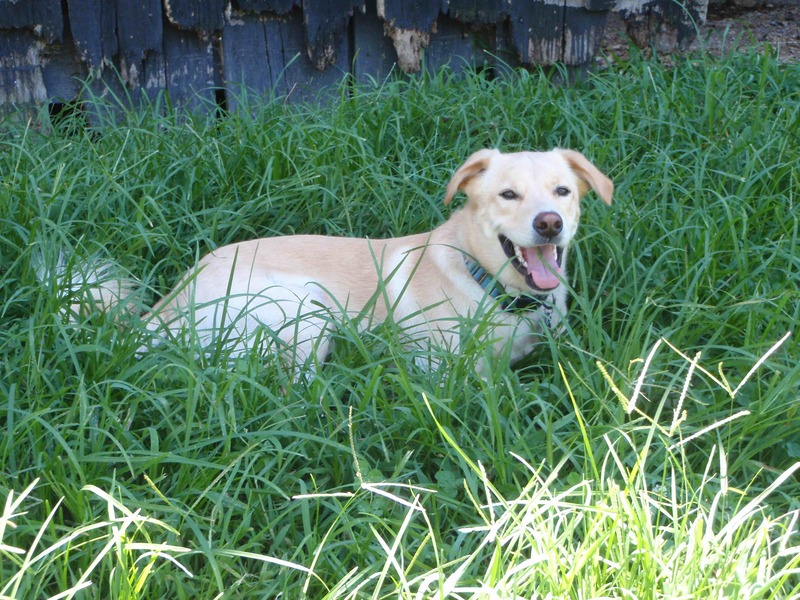 Each day this pen (and soon, others like it) will be moved one length onto fresh green grass and away from yesterday’s excrement. That means cleaner chicken for eating and a controlled amount of fertilizer put down on our pastures. 1. 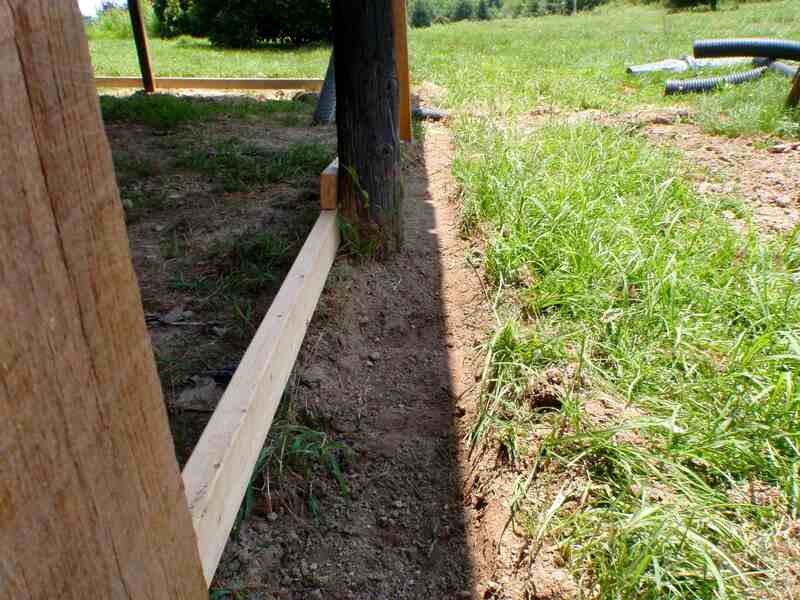 Lay the 12-foot 2 x 4’s parallel to each other on the ground. 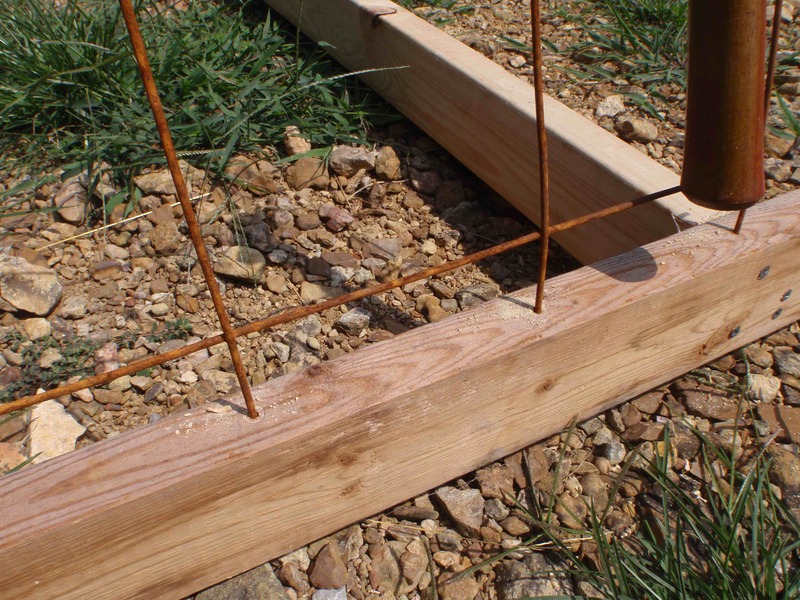 One foot in from each end, attach a 6-foot 2 x 2 to perpendicular to each 2 x 4. 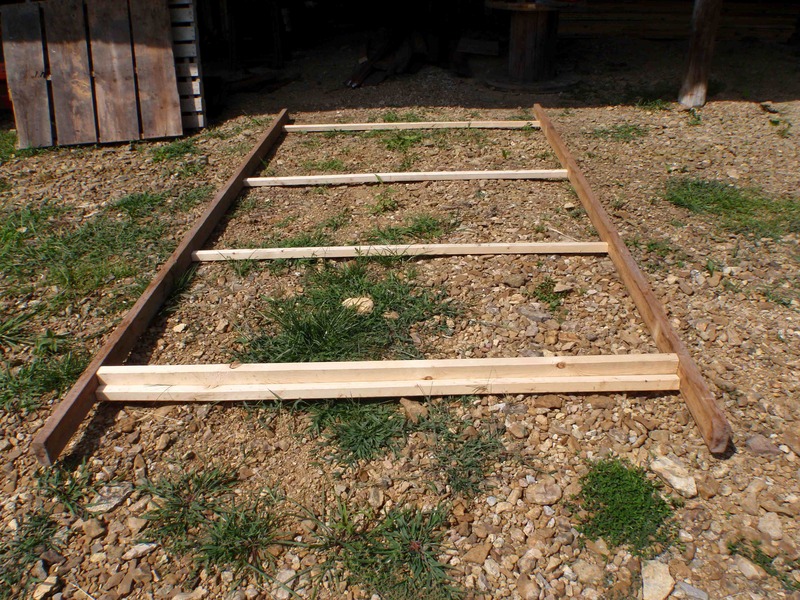 Then place the other 6-foot 2 x 2’s equidistant inside the first two to make a frame like shown below. 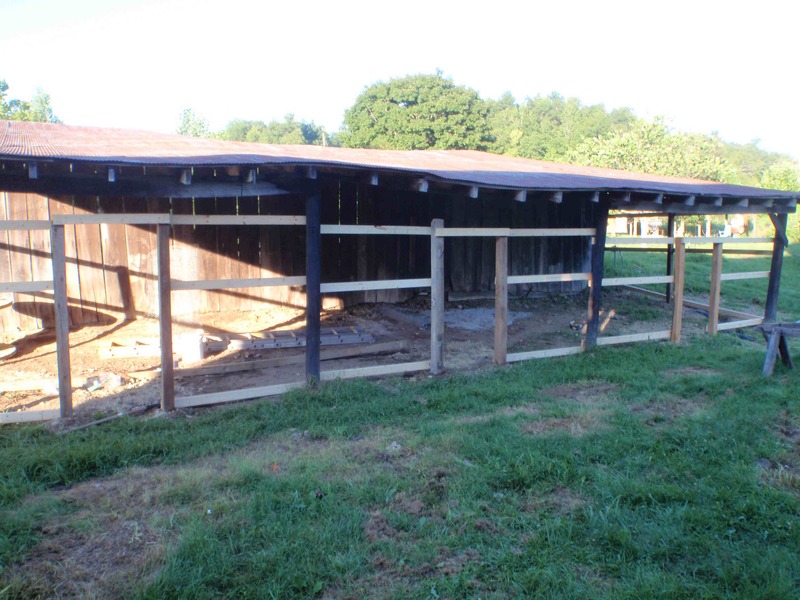 I used an extra scrap 2 x 4 to help solidify the front where we’d be dragging it. Braces attached to the skids. Braces attached to the skids along with the front plate for attaching the door later. 2. 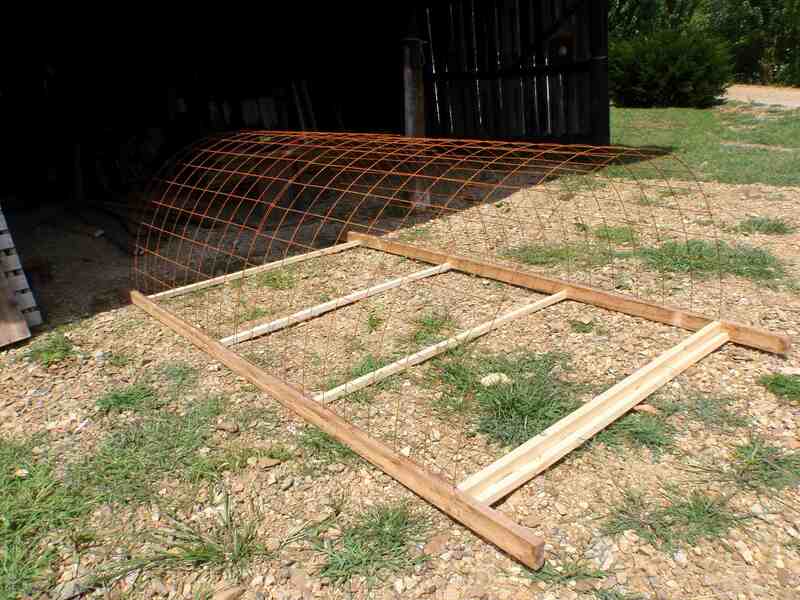 Lay one of your remesh sheets over the frame perpendicular to the wood. Note where the tag ends on the remesh are and drill holes with an appropriately-sized drill bit so that these ends of remesh can be inserted into the holes in the wood. Then repeat on the other side of the frame. Put the tag ends of the remesh into the drilled holes on one side of the frame and tap them down with your hammer, then go over to the other side and repeat the process. 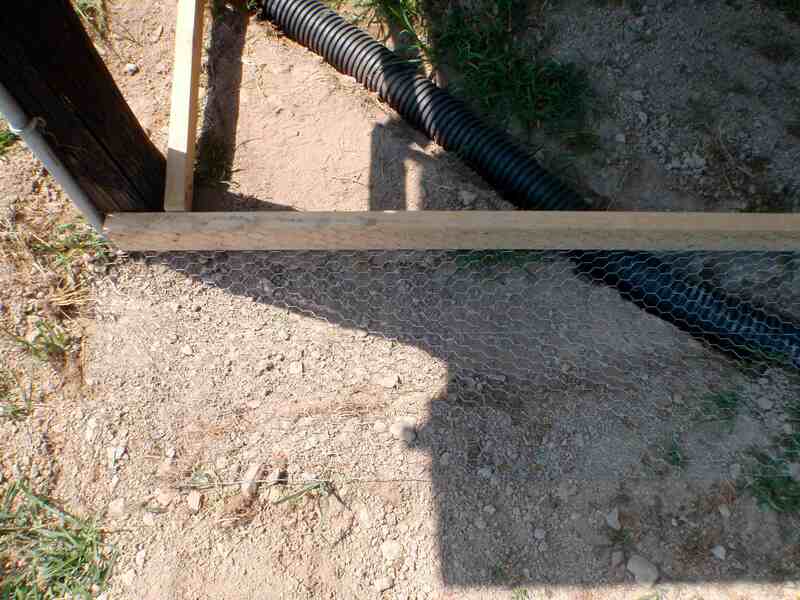 Use zip ties to secure the remesh to the wood. 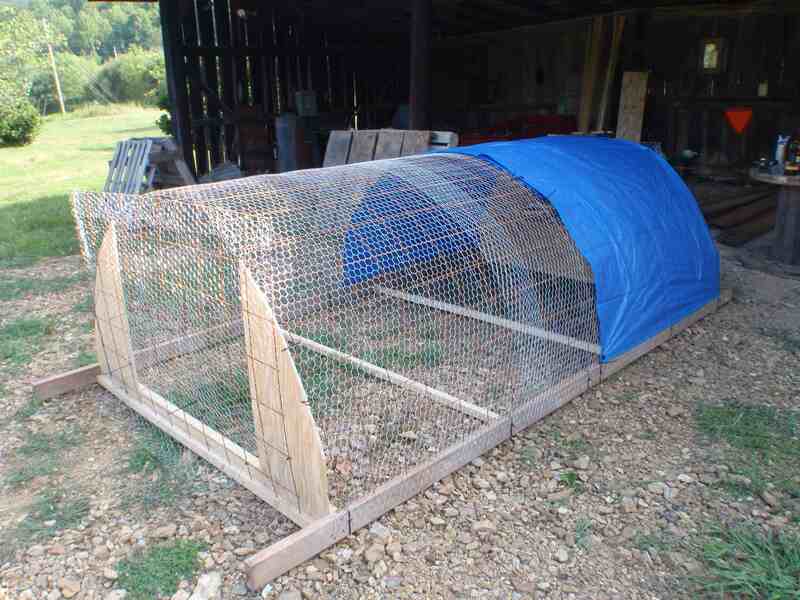 When you’re done you should have a short tunnel of remesh that covers one half of your wooden frame. See below. Ends of the remesh inserted into holes drilled in the skids. 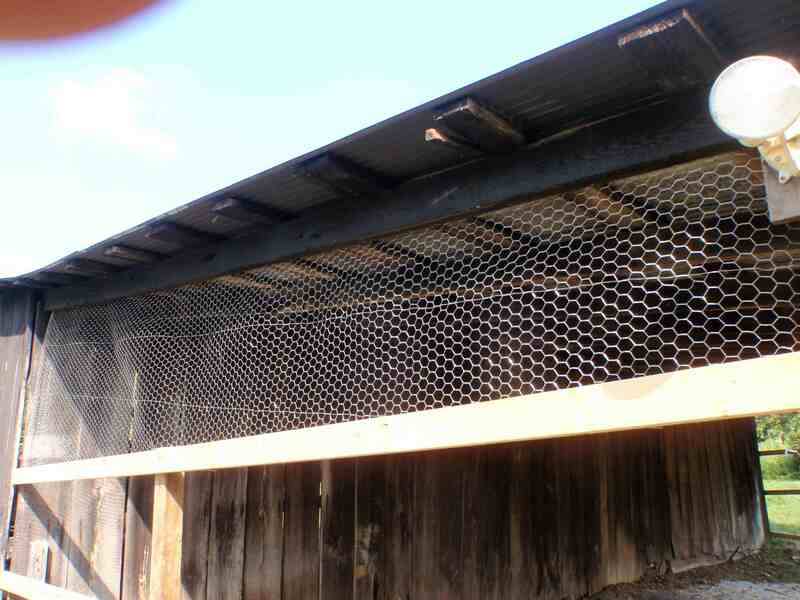 The remesh is bent and each end of it is placed into holes drilled in each skid. 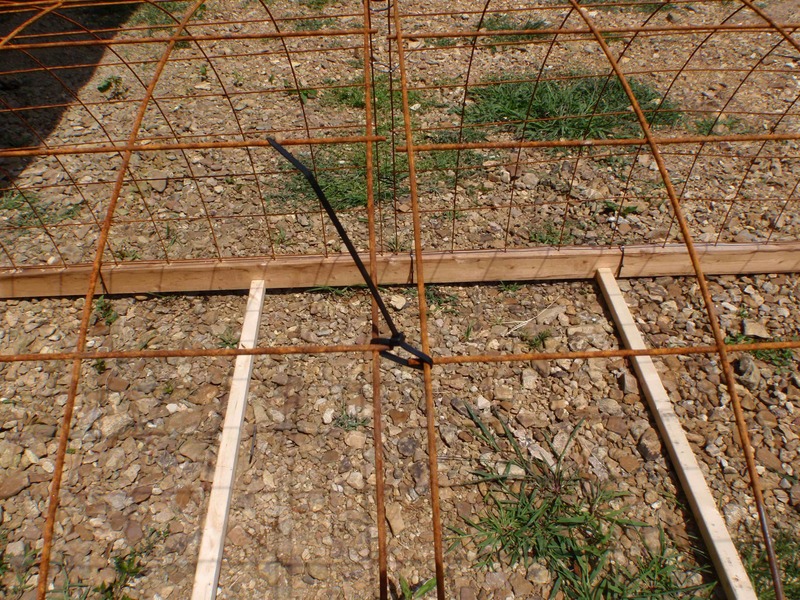 Then zip ties secure the remesh to the wooden frame. 3. Repeat step 2 using another sheet of remesh on the other end of the frame. Then zip tie the two tunnels of remesh together at the bottom and at several other points to help hold the whole thing together. Both sheets of remesh bent into the supporting hoop shapes. Zip ties hold the 2 sheets of remesh together in several places. 4. Use a jigsaw to cut some plywood scraps to fit all 4 corners of the chicken scooter. 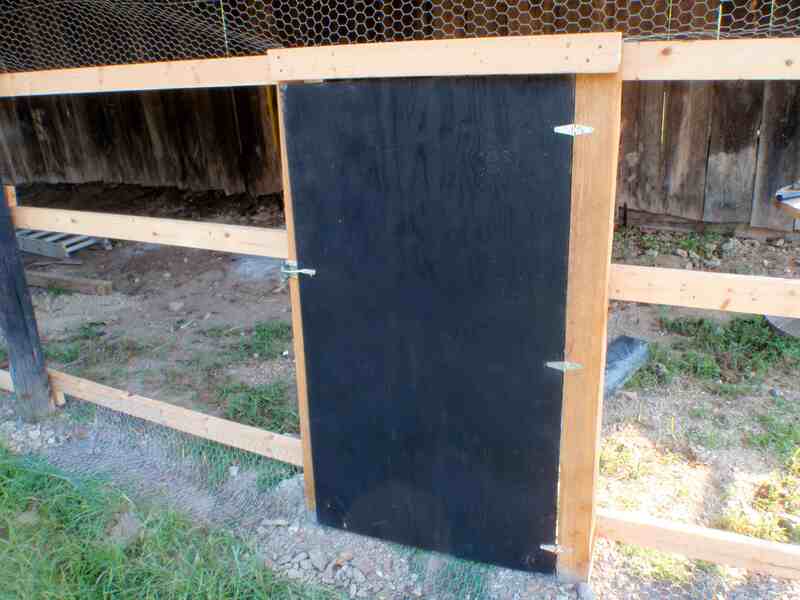 Attach them to the wooden frame with screws and the remesh with zip ties. Scrap plywood frames the front end for the door. More scrap plywood frames the solid back end of the scooter. 5. 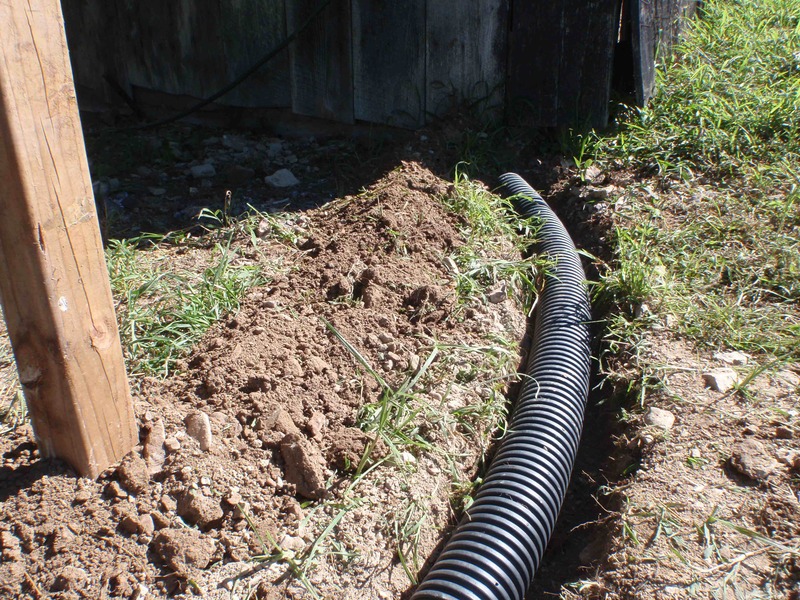 Now roll out your chicken wire and cut 3 10-foot lengths. 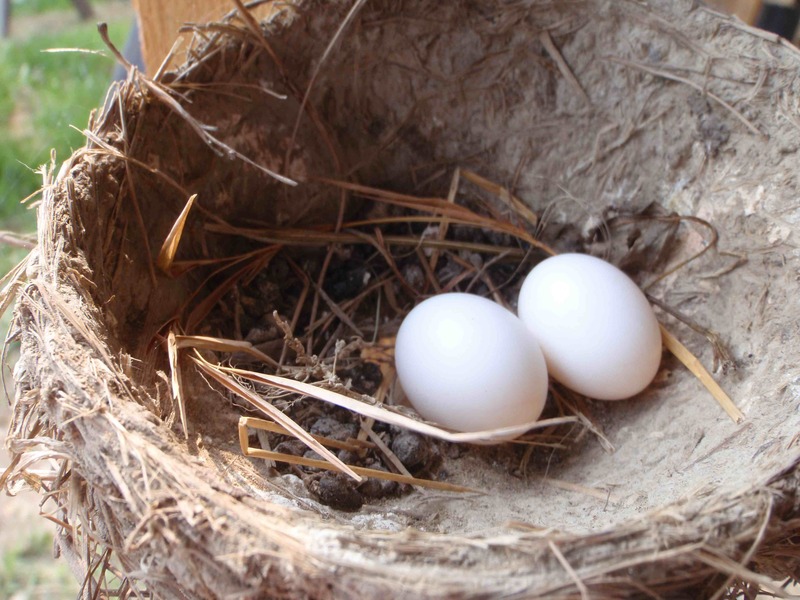 Put them over the remesh on one end and staple it to the wooden frame. Then do the other end. Save the middle part for last. 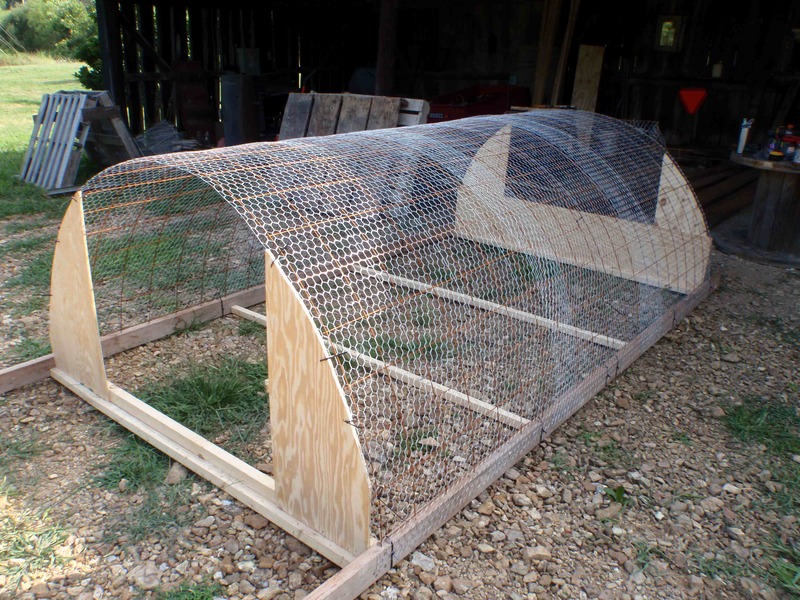 The chicken wire will overlap some in the middle, which is fine. You want to get the ends perfect, though, so do those first. 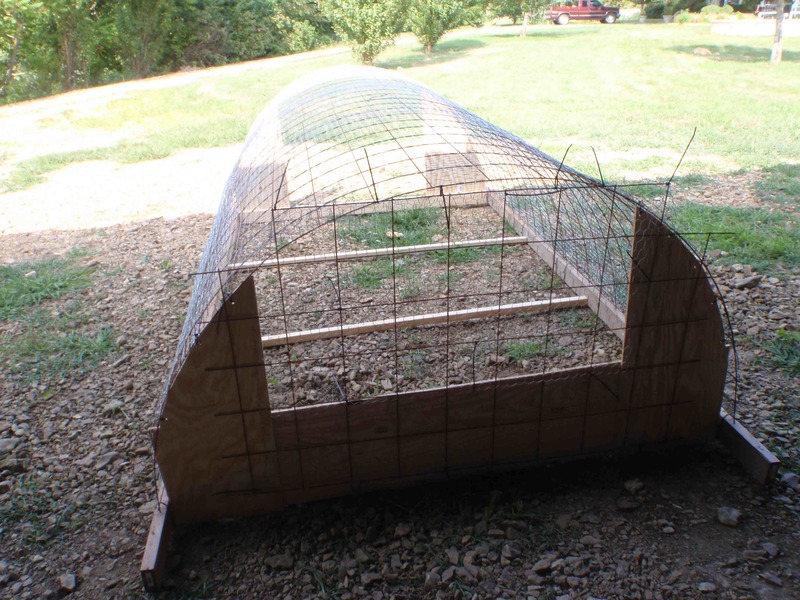 Secure with staples to the wood frame and with zip ties to the remesh. Chicken wire covering the front end of the scooter's remesh. 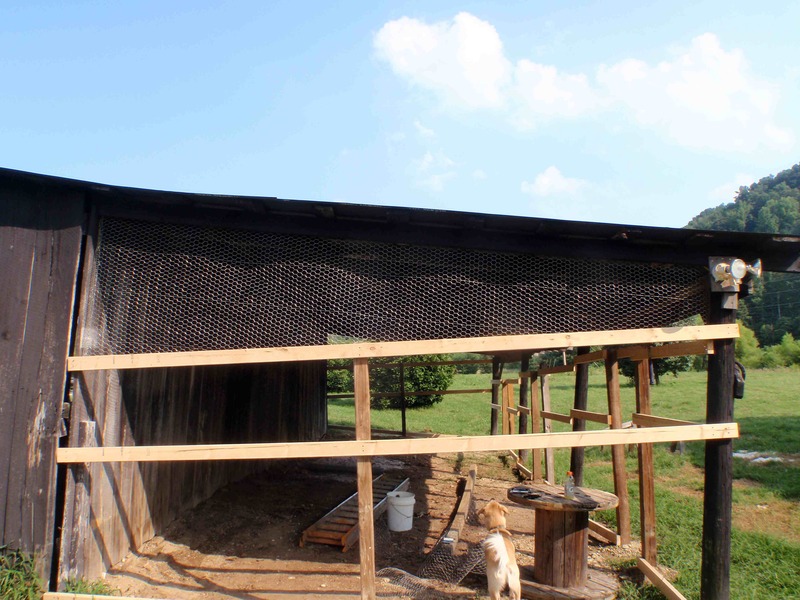 3 4-foot sheets of chicken wire are enough to cover the entire length of the remesh on the chicken scooter. 6. 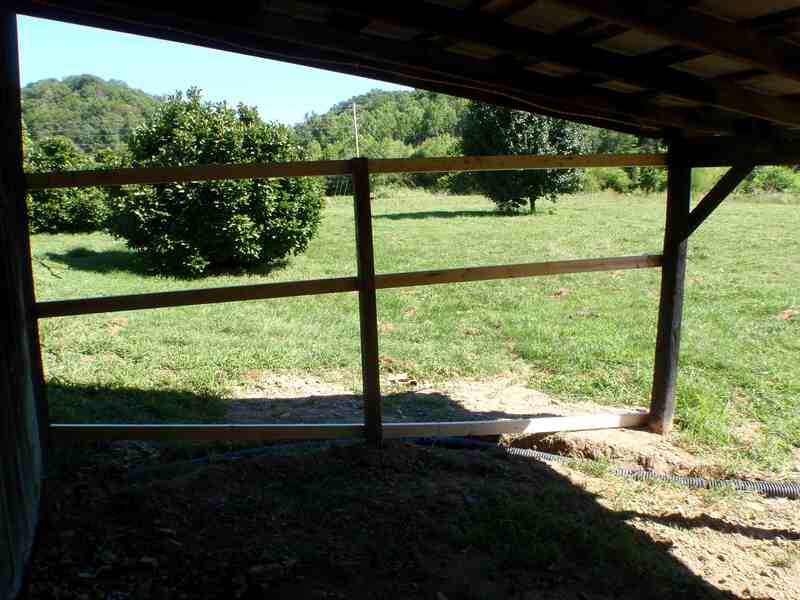 Using the 4 2-foot sections of 2 x 2, put in your corner braces. I recommend doing this WAY earlier, like between steps 1 and 2, but I forgot. Almost as easy to do it now, but just requires crawling into the chicken scooter structure. I found out it’s quite roomy and comfortable, FYI. 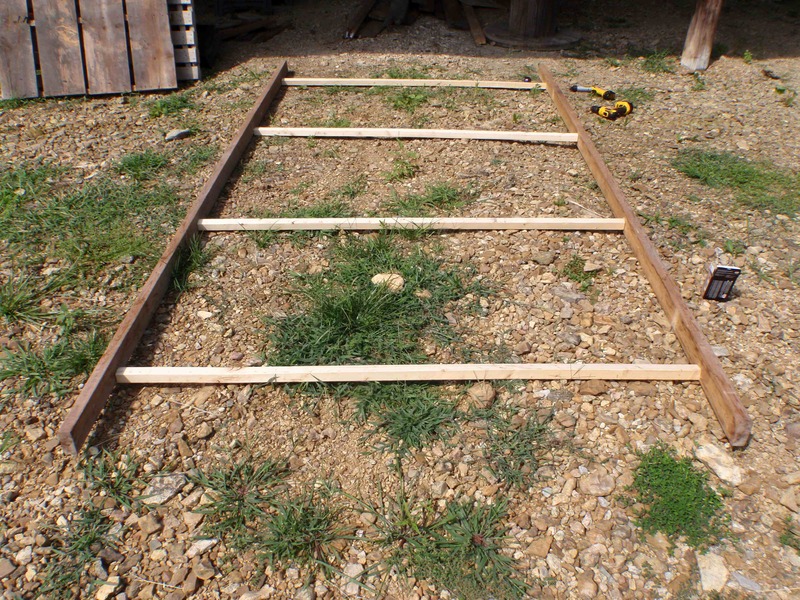 Angle cut the ends of the 2 x 2’s and screw them into the wood frame as shown below. 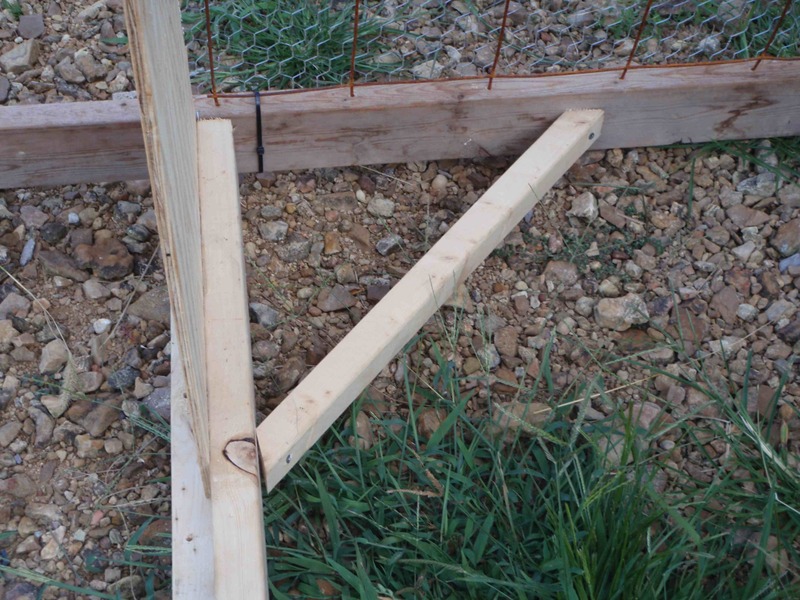 A scrap 2x2 length with angle cuts on the ends makes a serviceable corner brace for added stability when dragging the chicken scooter around the pasture. 7. 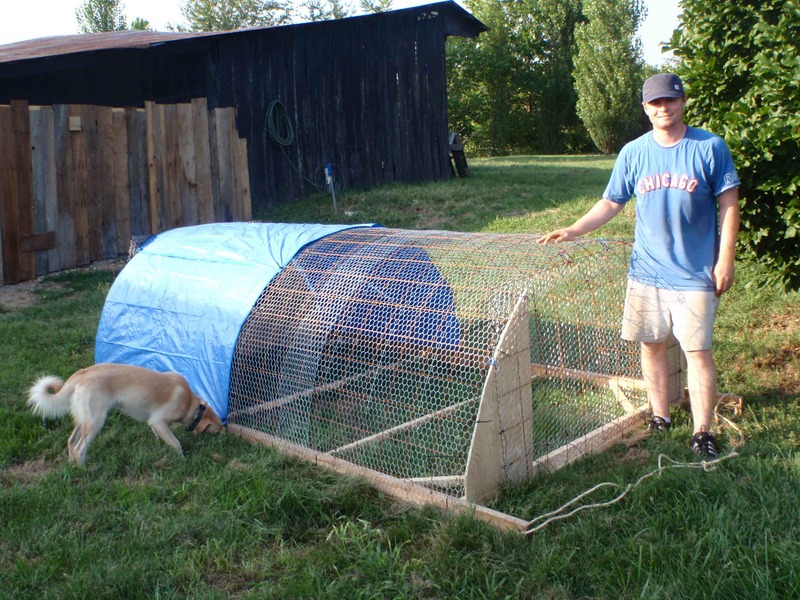 Put a section of tarp over the chicken wire on one half of the chicken scooter to provide some shade for the chickens. Secure the tarp with zip ties. 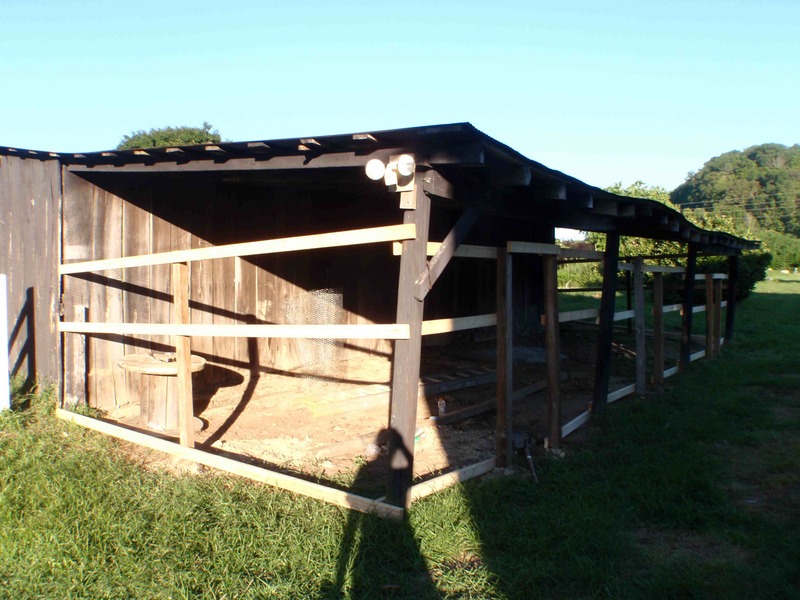 The tarp provides shade and shelter from the rain for the broilers. 8. I used pliers to cut the remesh for this next step, but if you have a linesaw it will probably make your day go faster and your hands be less sore. 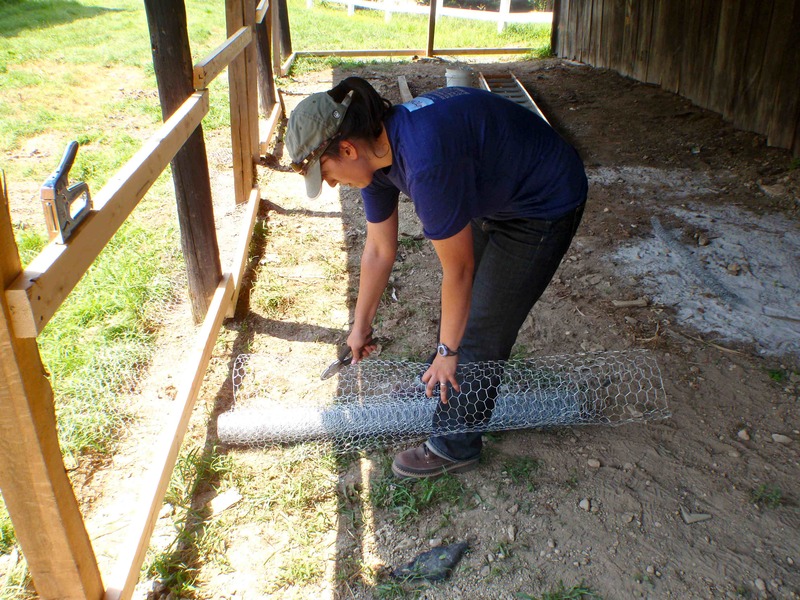 The cutting of the remesh with pliers took more time than the rest of this project put together. Anyway, cut the remesh to fit your openings on each end of the chicken scooter. 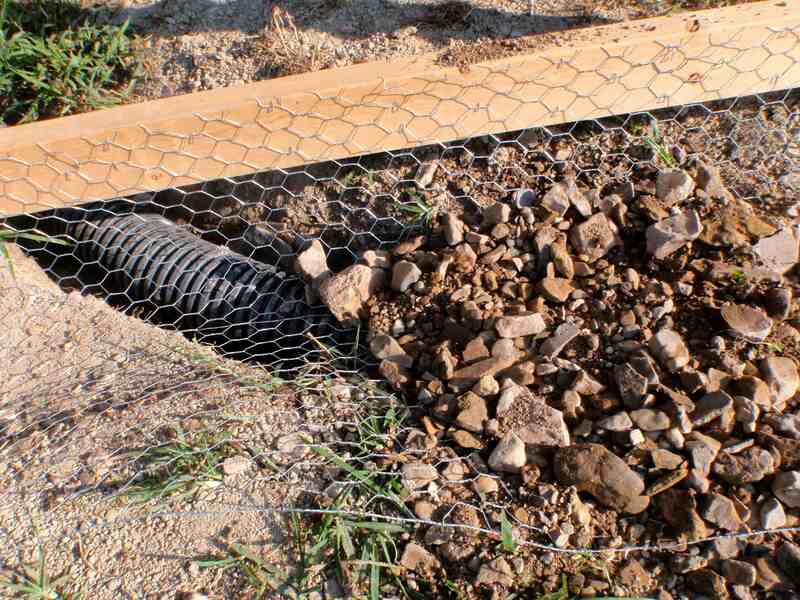 Cover the remesh with chicken wire using zip ties. 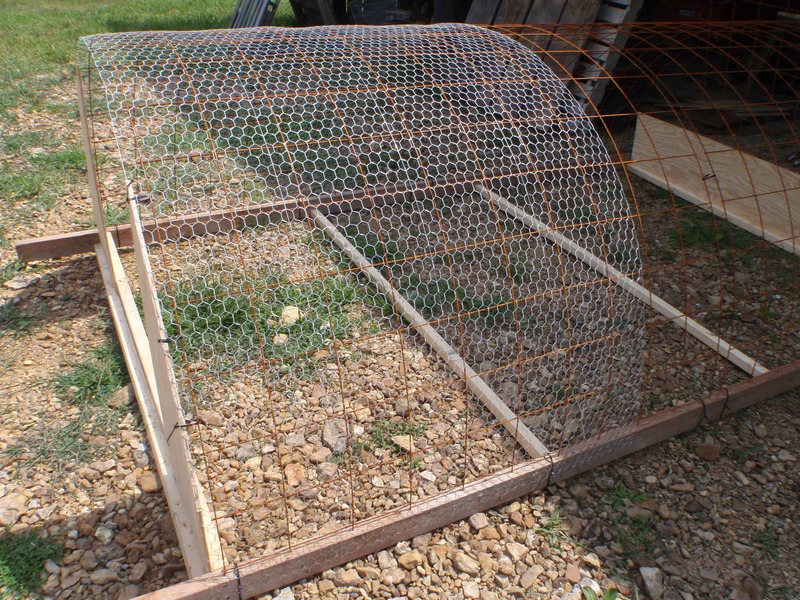 Attach the chicken-wire-covered remesh to each end with staples and zip ties on the back end (the end you won’t use for a door). 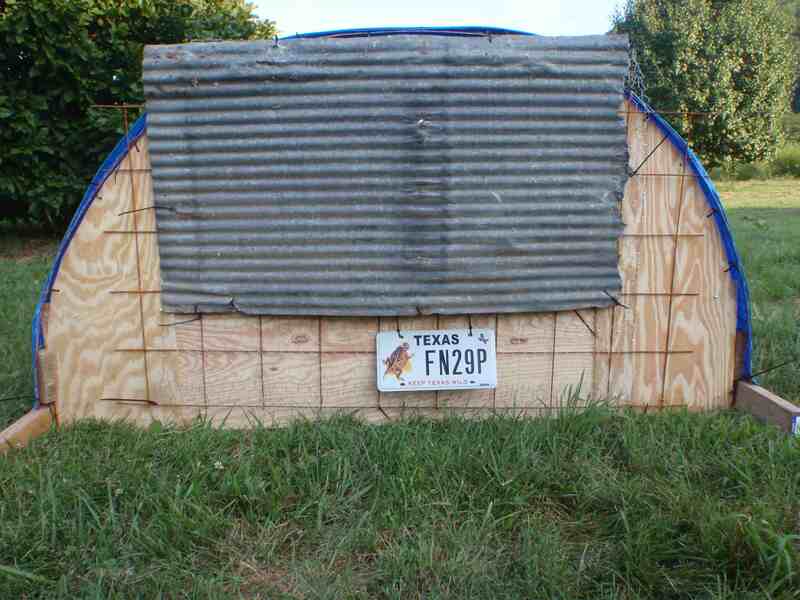 I then covered this with a scrap sheet of corrugated metal so that the chickens had one end of their scooter fully enclosed for protection from the weather and predators. We hooked one of my old license plates to the back end just for fun, but obviously that’s optional. 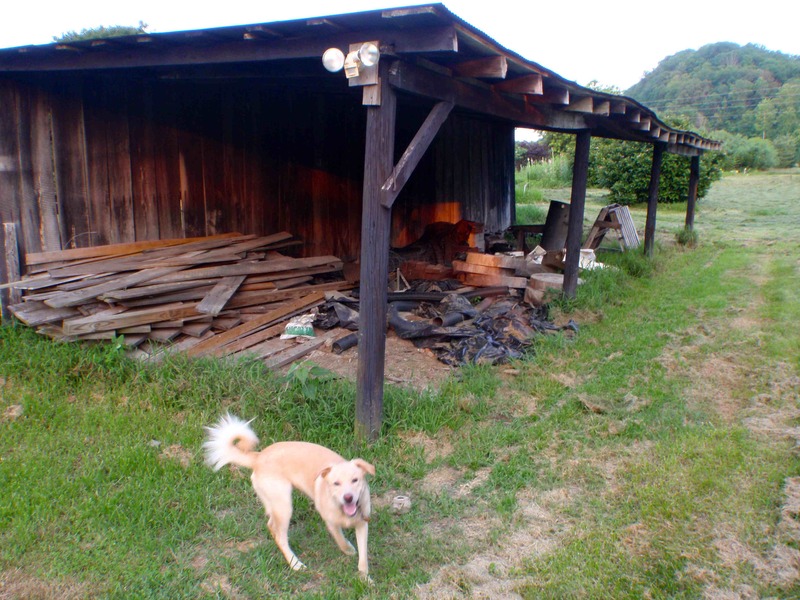 The solid back end provides shelter for the broilers as well as a place where predators have difficulty getting to them. 9. 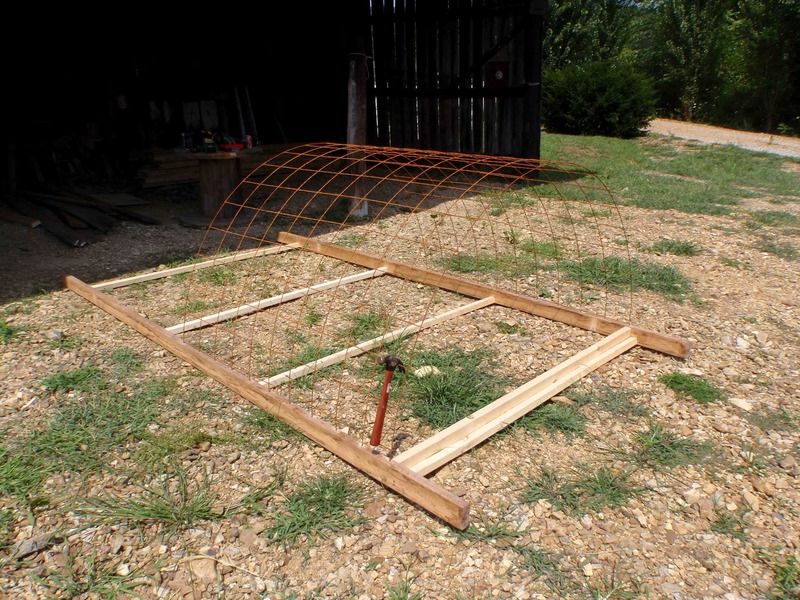 Do the same thing as in the previous step, just instead of attaching all of the metal to the remesh and chicken wire and tightening it down this side will become a door. 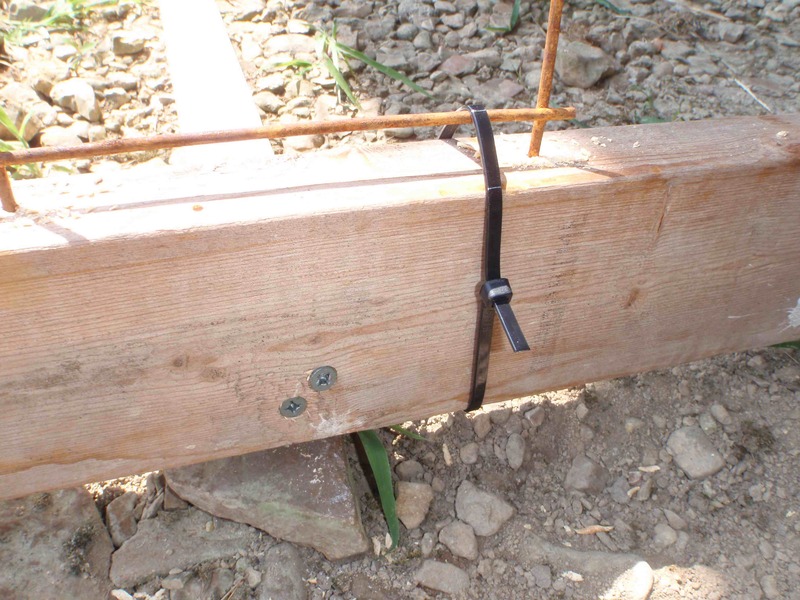 We tied the bottom of the door to the wood frame using zip ties. 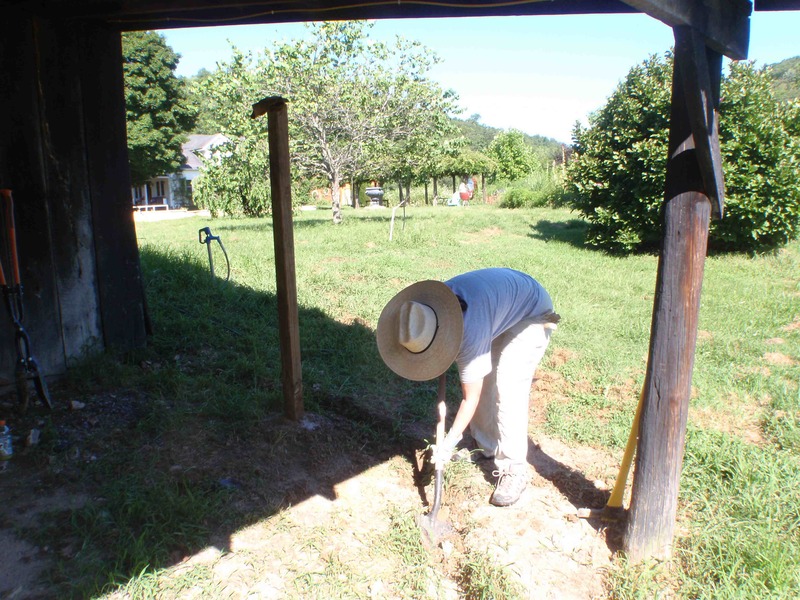 Then we used carabiners to secure the top so that we could just unhook them and ease the whole front down to allow us access to change water, add feed, or gather chickens up for processing. The poor-boy hinges made of zip ties allow the door to swing down. They are also cheap and fast to replace. 10. Drill two holes in the 12-foot 2 x 4’s in the front and put a loop of rope through it to help you pull the scooter around. It’s actually really lightweight. 11. Pull the rope until you get your chicken scooter to the pasture you want your chickens to use. 12. 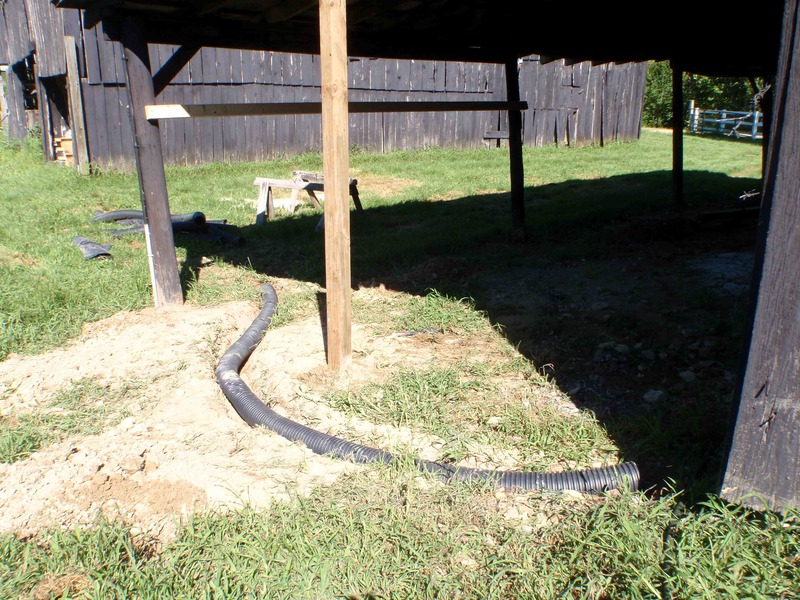 Add waterer, feed trough, and chickens. Move daily. Well, there’s your 12-step program for building a chicken scooter!